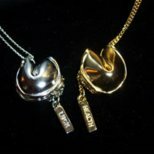 Good Fortune Necklace [Good Fortune Necklace] - $24.95 : NewDaVincis.com!, Great Innovative Products, Gadgets and more. Introducing Good Fortune by Bee Charming. This unique piece comes in silver tone or gold tone on a 17 inch chain, beautifully packed in a mini Chinese gold or silver rice box. Fame, Happiness, Health, Love, Luck, Wealth. The fortune comes contained in the cookie, on a metal chain, but can also be worn hanging down, outside of the cookie. When filling in your order, please indicate the Color and the Tag you selected (in the notes section). Thanks.